[By Nick] I have no witty intro for this review. I could take the easy way out and say it was a piece of cake picking this ice cream up while I was at the Niskayuna Co-op. Oh wait, I guess that works. The main reason I wanted to try this flavor is because it's a nice change up from your typical cake flavored ice cream. I can't think of any yellow cake flavored ice creams off the top of my head and pound cake seems very underused to me. Oh and chocolate frosting swirls need to be done more. I loved the one in Ben & Jerry's Cake Batter. It looks quite yellow with signs of the swirls underneath. There's a strong yellow cake smell coming from this ice cream as well. Like almost as if I had just baked up a cake and let it cool a bit. If that's not a comforting smell, I don't know what it. Let's dig some out and see what we have for mix-ins. Look at that swirl! It's on par with the thickness of Moose Track fudge. It's just more pliable and gooey like frosting would be. The yellow cake flavored base is spot on to the namesake. Flashbacks of all the cakes my mom would bake for my birthday growing up basically hit me straight on. 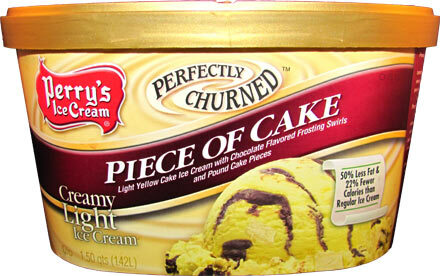 Perry's deserves a round of applause for how close to a replica this ice cream is to yellow cake. It's kind of amazing and throw in the fact it's light ice cream. They're not messing around. The chocolate icing is well, icing on the cake. 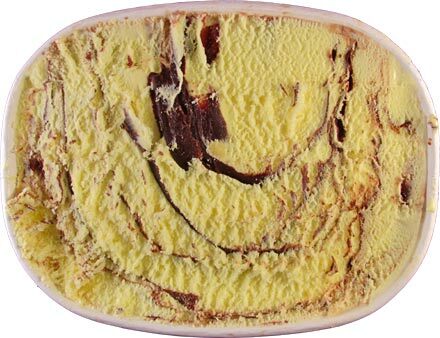 It tastes just like Ben & Jerry's swirl and I'd be if I didn't feel like I was eating a chocolate iced yellow cake. The similarities are uncanny. If the texture of cake and ice cream weren't so different, you'd have my fooled. 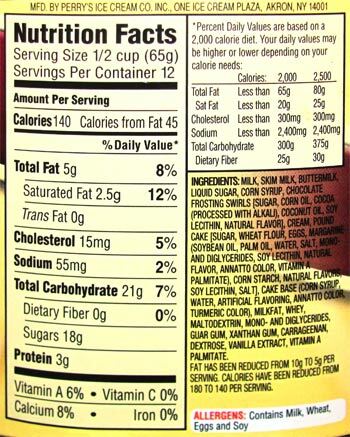 But wait, isn't that where the pound cake chunks come in? Their flavor isn't all that strong but their texture give this the complete cake feeling. They're more spongy in texture than dense. The chunks just have that unmistakable cake texture to them. Not dry and crumbly but moist and another word I can't think of right now. It just works. This whole flavor works. There's nothing I can complain about. This has to be up there as one of my favorite cake ice cream as well as light ice cream. If you see it, pick it up. You will not be disappointed! This was one of my favorite ice cream flavors when I was in grad school in upstate NY. Now I am back on the West coast and can't get it anymore! I miss it. 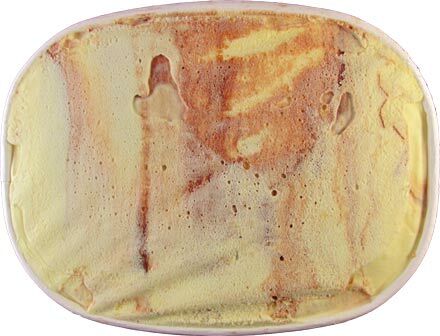 I guess you forgot that Edy's "Take the Cake" ice cream that is no longer produced was a yellow cake ice cream flavor as it was colored yellow. As a lover of all things cake, I wish this brand was in my area. Nick, Turkey Hill had a similar flavor called Batter Up! It was one of my faves! I would love to try this one, but have never heard of Perry's brand ice cream. Where do you buy it? Stride. I never tried Edy's Take The Cake. That was Dubba who reviewed it. That and I said I couldn't remember off the top of my head.I'm sure if I did research I would've found way more yellow cake ice creams. Danielle, it surprises me that you can't find Perry's in NJ. The Toy Box, Perry's is mainly in the North East. Doesn't seem to be in MA. Dubba, have you seen it? last anon: Any chance you live near one of the new Wegmans in the state? They will have some. I do! I can look at Chestnut Hill or Burlington. I had the regular version at least ten years ago. I never had the light. When I first had the regular I thought....nothing will ever be better. As far as ice cream goes, I still haven't found one I love more.